← Read Twice, Bake Once. Our third video series, “18th Century Cooking with Jas. 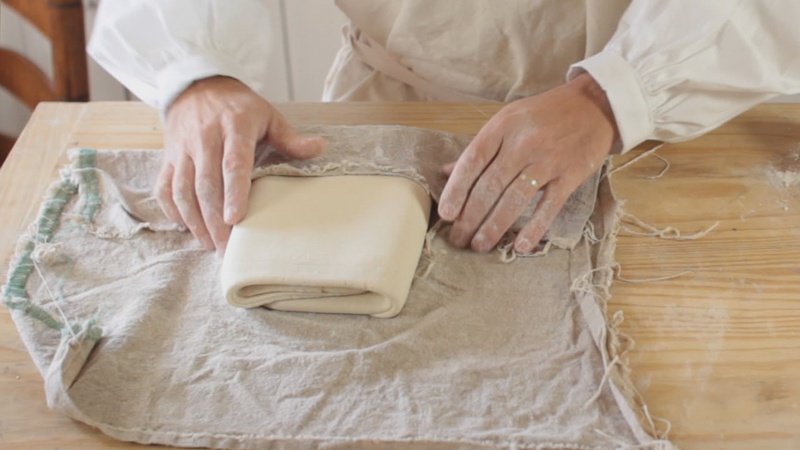 Townsend & Son,” is embarking on a closer look at the three more common types of pastry crusts used in 18th century cookery: the standing crust, the puff paste, and the short crust (also known as the common paste or cold paste). Pastry crusts were foundational to a great many 18th century dishes. 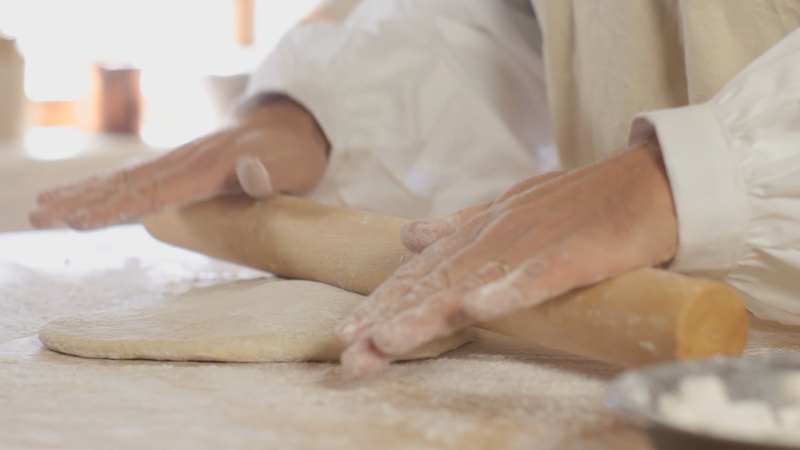 Our second video installment (above) focuses on the puff paste. I am also including an 18th century recipe for beef pasties at the end of this post. Puff pastry was a very popular form of pastry crust in the 18th century. It was commonly used for pies, pasties, and fried patties (what we would think of as a fried turnover). A number of period cookbooks suggest puff pastry is best for meat dishes, though others also recommend a thin puff paste for fruit tarts. According to the Oxford English Dictionary, recipes for puff pastry first began to appear in cookbooks in the early 1600’s. The basic ingredients for puff paste are virtually the same as those used in standing and short crusts: flour, water, a little salt, and fat, but the key to making a good puff paste is found in how one goes about bringing the ingredients together. 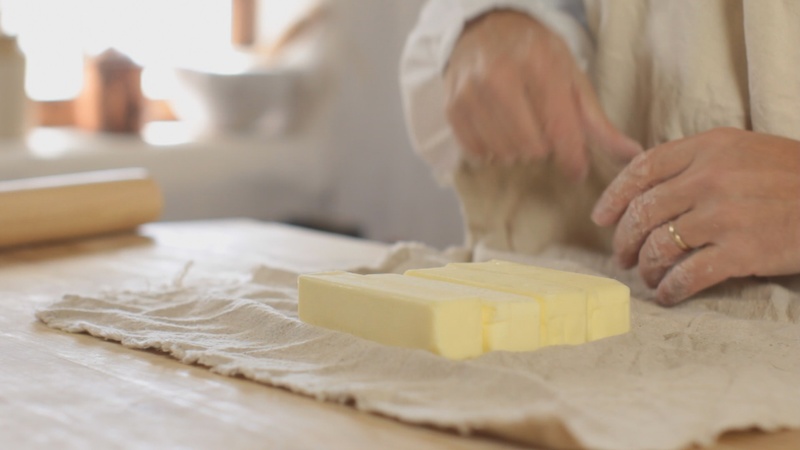 Rather than incorporating the fat (i.e., butter) into the flour by cutting or rubbing it in as with a short crust, or by melting it before mixing as with a standing crust, the butter used in a puff paste is for the most part sandwiched in between layers of dough. The butter/dough sandwich is then repeatedly rolled out thin and folded upon itself. During this whole procedure, the dough and butter are kept chilled to prevent the butter from melting and thus becoming completely integrated. The layering of butter between thin sheets of dough results in an exquisitely flaky crust unequaled by other construction methods. For our recipe, we are using a 1:1 ratio of flour to fat: one pound of pastry flour and one pound of butter. We have chosen pastry flour because of its low protein content which makes it easier to roll out. We are also using egg whites instead of water. Egg whites result in a dough that is easier to roll out, but it will also result in a finished product that has a crisper, crackly texture. To make a foundational dough, mix the first three ingredients. If the dough is too sticky, add additional flour, a little at a time. The dough should be soft and easy to work. Knead the dough on a well-floured surface for about 10 minutes. Cover your dough and set it aside while you work on the next step. Next, lay out four sticks of butter side-by-side on a piece of cloth or plastic wrap. Cover the butter with the same and press it with a rolling pin into a single patty of butter about 1/2″ thick. Don’t be afraid to show your butter who’s the boss. Once you’ve reached the desired thickness, set your butter aside, keeping it as cold as possible. 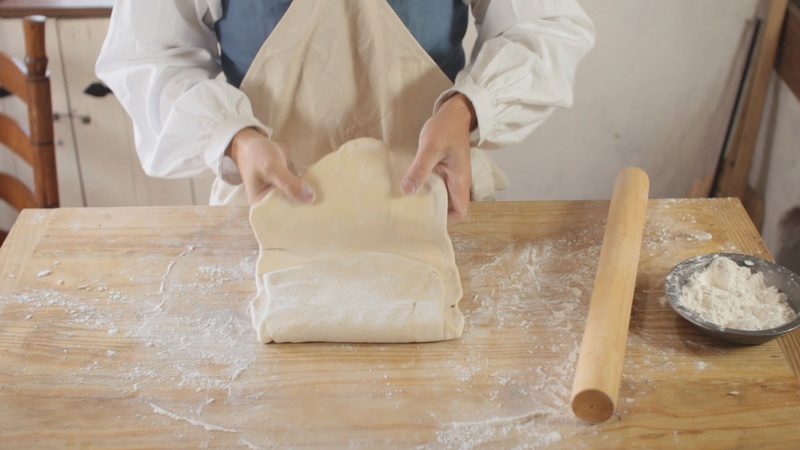 Next, roll out your dough into a large square, until it’s about 1/8″ thick — maybe just a bit more. Place your pad of butter in the center of your square and fold the dough snugly around the butter like an envelope. 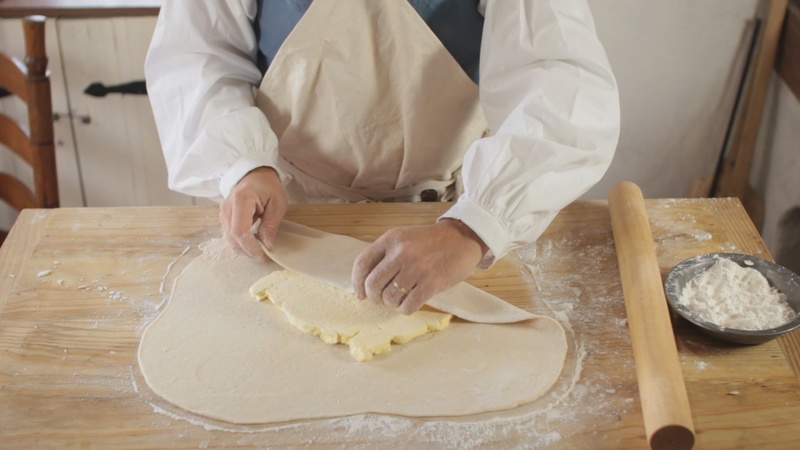 Roll the pastry into a long rectangle about 18″ long by 8″ wide by about 1/4″ thick. Fold the dough onto itself in thirds. Turn 90-degrees, and roll out to 1/4″ thick once more. Fold into thirds again, cover with a cloth, and allow your dough to rest for 5 to 10 minutes in a cool place (e.g., your refrigerator). Repeat this process three more times, allowing your dough to rest each time. Once you’ve done this folding and rolling process a total of four times, it’s time to roll the dough out one last time to the final thickness you wish to use it. This dough can be quite stiff and stubborn to work with. It has a tendency when rolled out to shrink right back to a smaller thicker shape. This is the case even when using cake flour, but it is even more of a battle if you opt for all-purpose flour. AH! But here’s a little secret technique that you won’t even see in the video! During the filming of the above video, Jon and I took a break right at this point in the process. Jon left the set to tend to a few other business matters. I told him I would roll the dough out to the final thickness. I had done this a number of times before, struggling each time with the dough’s elasticity. I would work up a sweat rolling the dough out to the perfect thickness only to have it spring back out of protest to a smaller and thicker size. I had read a number of period recipes that prescribed “beating the dough well.” Up to this point, I figured that was an 18th century euphemism for “rolling it out.” My assumption was based on other such unfamiliar terms used in the old recipes. Take, for instance, the phrase, “cast the eggs until they are light.” “Cast” means to whip. So “beat” probably means to roll out, right? “Beat” means to beat. I discovered this through my frustration. 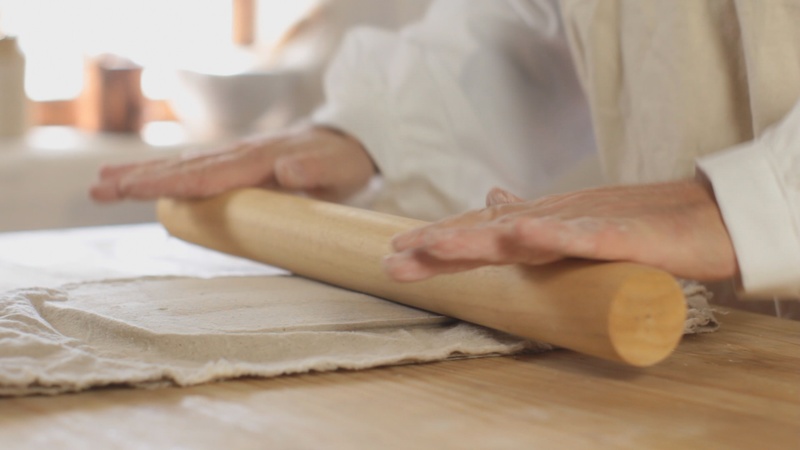 A rolling pin is the weapon of choice. I normally don’t condone this type of behavior — especially in the kitchen, but if you stay focused on the dough, trust me, it will be o.k. So as you roll out your dough to its final thickness, if it resists and shrinks back to a smaller size, whack it a few times with your rolling pin. Start with a few gentle whacks at first, until you get a feel for how much the dough can handle. Try it. I think you’ll be surprised at how persuasive this technique is. And you may ashamedly find it to be a little therapeutic. 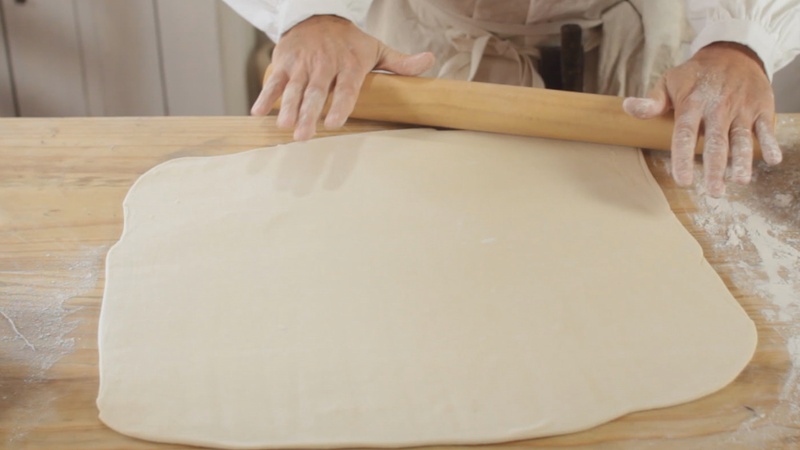 Once you have rolled out your dough to its final thickness, you’re ready to cut it to size. It can be used to line pie pans or to top them. You can cut out a circle of the dough, pile on some seasoned meat, and seal the edges by brushing them with egg and crimping them over. Baked or fried, the possibilities are nearly endless. At the risk of stepping into a very old culinary fray, the quintessential English beef pasty is probably better known as the Cornish pasty. the modern Cornish pasty is a heritage food protected by British law. By definition, it contains chopped beef, potatoes, onions, and “swede” (otherwise known as yellow turnips or rutabaga). Our recipe, on the other hand, is an authentic 18th century version that uses only seasoned beef. Pasties are thought by many to have originated as a food for the upper class, since the earliest recipes called exclusively for venison. By the end of the 18th century, however, other meats, e.g., beef and mutton, were used as a substitute to venison, and the convenient meal-on-the-go made its way into the grimy hands of field workers and miners. 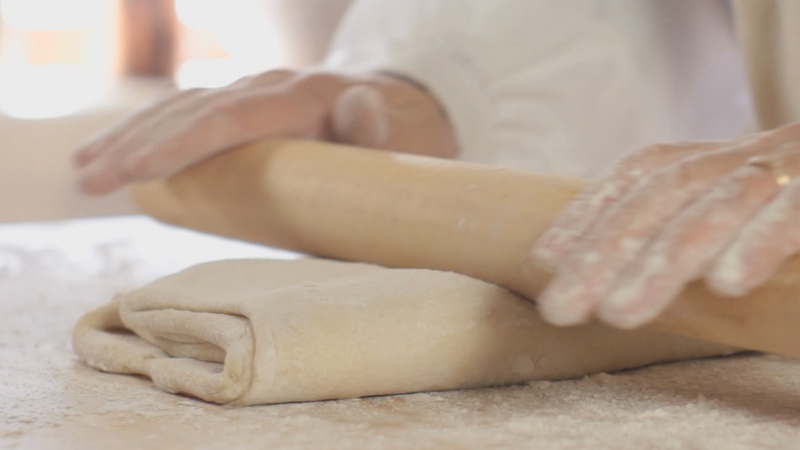 Your puff pastry should be rolled out to less than 1/4″ thick. Cut out two circles approximately 9″ in diameter. Set aside. Season the chopped beef with salt and pepper, and divide into two equal portions. Spoon the meat onto the middle of each puff pastry round and dab it with a little butter. brush the edges of each round with egg wash and fold the round in half. Seal the edges by folding them over, pinching them as you go. Brush each pasty with egg wash. Cut a couple of vent holes through the pastry dough. Place each pasty on a paper-lined baking sheet, and bake at 350-degrees (F) for one hour, or until golden brown. This entry was posted in Baking, Ingredients, Pies, Recipe, Video and tagged beat, beef pasties, cornish, crust, pasty, puff paste. Bookmark the permalink. Thank you for this recipe! 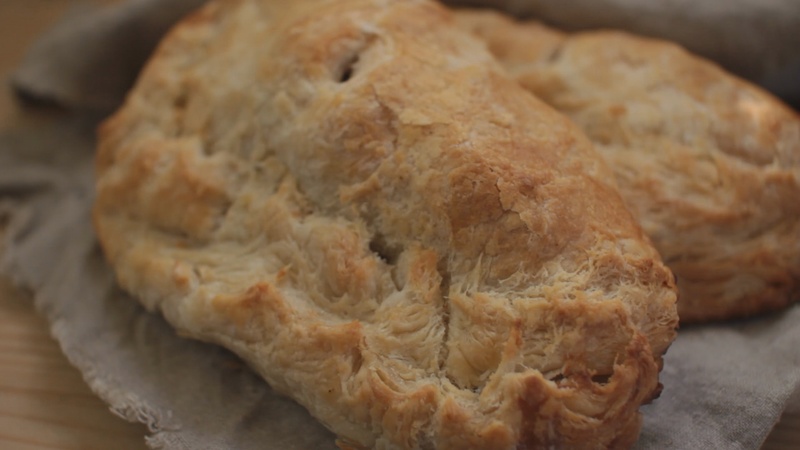 I have been wanting a Pasty recipe for a long time. Some that I found were more like pie crust. I am so pleased to have found this site and am look forward to making many of these fine dishes. I was looking for puff pastry recipes that used the egg whites in order to make the traditional portuguese Pastel de Nata; normally people use the water version, but the secret Pastel de Belém recipe (the same pastry, better in flavour but only done in one store in Lisbon) is said to use the egg whites and theirs does have a much crunchier crust. I’m curious to know about the long-term storage options for this dough. Could you freeze any unused portions (in a modern kitchen, of course) and thaw it slow in the fridge to use later? As you might with pre-made frozen puff pastry from the grocery store, I mean. While I haven’t tried storing it for any length of time in the freezer, I don’t see why not!